Overpopulation is a myth. This myth has caused human rights abuses around the world, forced population control, denied medicines to the poor, and targeted attacks on ethnic minorities and women. According to the Verge, Ancestry.com, is seeking permission from the FDA to create a national DNA database. Ancestry.com claims they’ll use your DNA to assess your families disease risk. Would it shock you to know that Google, the NSA and DHS are using “front companies” to create a GLOBAL DNA database? Is Ancestry.com giving people straight info. about their ancestry? Are they in actuality working for the government? In March of this year Ancestry.com let police search their DNA database without a warrant! Without a warrant or court order, police investigators were able to run the crime scene DNA against Sorenson’s private genealogical DNA data. The search turned up 41 potential familial matches to Michael Usry. The cops then asked Ancestry.com, not only for the “protected” name associated with that profile, but also for all “all information including full names, date of births, date and other information pertaining to the original donor to the Sorenson Molecular Genealogy project.” FYI, Ancestry.com offered to disclose this information in response to a simple subpoena. The above quote comes from Linus Pauling, Ph.D, and two time Nobel Prize winner in chemistry (1901-1994). He is considered one of the most important scientists in history. He is one of the founders of quantum chemistry and molecular biology, who was also a well known peace activist. He was invited to be in charge of the Chemistry division of the Manhattan Project, but refused. He has also done a lot of work on military applications, and has pretty much done and seen it all when it comes to the world of science. A quick Google search will suffice if you’d like to learn more about him. This man has been around the block, and obviously knows a thing or two about this subject. And he’s not the only expert from around the world expressing similar beliefs and voicing his opinion. Here is another great example of a hard hitting quote when it comes to scientific fraud and manipulation. It comes from Dr. Marcia Angell, a physician and long time Editor in Chief of the New England Medical Journal (NEMJ), which is considered to be one of the most prestigious peer-reviewed medical journals in the world. I apologize if you have seen it before in my articles, but it is quite the statement. He also alluded to the fact that cancer treatment, in general, has been a complete failure. Today, treating illness and disease has a corporate side. It is an enormously profitable industry, but only when geared towards treatment, not preventative measures or cures, and that’s an important point to consider. Another quote that relates to my point above was made by Dr. Dean Burk, an American biochemist and a senior chemist for the National Cancer Institute. His paper, “The Determination of Enzyme Dissociation Constants (source),” published in the Journal of the American Chemical Society in 1934, is one of the most frequently cited papers in the history of biochemistry. In 2009, the University of Michigan’s comprehensive cancer center published an analysis that revealed popular cancer studies are false, and that there were fabricated results arising due to conflicts of interest. They suggested that the fabricated results were a result of what would work best for drug companies. After all, a large portion of cancer research is funded directly by them. You can read more about that story here. There is so much information out there, and so much of it is coming from people who have been directly involved in these proceedings. There is really no shortage of credible sources willing to state that we live in a world of scientific fraud and manipulation. All of this can be attributed to the “corporatocracy” we live in today, where giant corporations owned by a select group of “elite” people have basically taken control over the planet and all of its resources. This is precisely why so many people are flocking towards alternative treatment, as well as focusing on cancer prevention. Much of what we surround ourselves with on a daily basis has been linked to cancer. Everything from pesticides, GMOs, multiple cosmetic products, certain “foods,” smoking, and much much more. This is something that is never really emphasized, we always seem to just assume that donating money to charities will make the problem go away, despite the fact that their business practices are highly questionable. That being said, so many people have had success with alternative treatments like cannabis oil – combined with a raw diet or even incorporated into their chemotherapy regimen – that we should not feel as though there is no hope for the future. The official stance on cannabis is a great example of the very practice of misinformation that I’m talking about. Its anti-tumoral properties have been demonstrated for decades, yet no clinical trials are taking place. I am going to leave you with this video, as I have done in previous articles. It provides a little food for thought. Ignorance is not the answer, although this information can be scary to consider, it’s nothing to turn a blind eye towards. NaturalNews) On February 27, the Austin City Council addressed agenda item no. 19, an action to authorize and award an extending million-dollar contract with Mosaic Crop Nutrition, LLC, the city’s hydrofluorosilicic acid supplier. The Fla.-based company commends itself for being the world’s leading supplier of “potash,” an alkaline potassium compound, and phosphate, which is mined from nearly 2,000 acres of Mosaic-owned land in central Fla. The silicofluorides used to fluoridate the water are unprocessed industrial byproducts of the phosphate fertilizer industry. As my colleague Ryan Devereaux reports, a lower UK court this morning, as long expected, upheld the legality of the nine-hour detention of my partner, David Miranda, at Heathrow Airport last August, even as it acknowledged that the detention was “an indirect interference with press freedom”. For good measure, the court also refused permission to appeal (though permission can still be granted by the appellate court). David was detained and interrogated under the Terrorism Act of 2000. The UK Government expressly argued that the release of the Snowden documents (which the free world calls “award–winning journalism“) is actually tantamount to “terrorism”, the same theory now being used by the Egyptian military regime to prosecute Al Jazeera journalists as terrorists. Congratulations to the UK government on the illustrious company it is once again keeping. British officials have also repeatedly threatened criminal prosecution of everyone involved in this reporting, including Guardian journalists and editors. Equating journalism with terrorism has a long and storied tradition. Indeed, as Jon Schwarz has documented, the U.S. Government has frequently denounced nations for doing exactly this. Just last April, Under Secretary of State Tara Sonenshine dramatically informed the public that many repressive, terrible nations actually “misuse terrorism laws to prosecute and imprison journalists.” When visiting Ethiopia in 2012, U.S. Deputy Secretary of State William Burns publicly disclosed that in meetings with that nation’s officials, the United States “express[ed] our concern that the application of anti-terrorism laws can sometimes undermine freedom of expression and independent media.” The same year, the State Department reported that Burundi was prosecuting a journalist under terrorism laws. It should surprise nobody that the UK is not merely included in, but is one of the leaders of, this group of nations which regularly wages war on basic press freedoms. In the 1970s, British journalist Duncan Campbell was criminally prosecuted for the crime of reporting on the mere existence of the GCHQ, while fellow journalist Mark Hosenball, now of Reuters, was forced to leave the country. The monarchy has no constitutional guarantee of a free press. The UK government routinely threatens newspapers with all sorts of sanctions for national security reporting it dislikes. Its Official Secrets Act makes it incredibly easy to prosecute journalists and others for disclosing anything which political officials want to keep secret. For that reason, it was able to force the Guardian to destroy its own computers containing Snowden material precisely because the paper’s editors knew that British courts would slavishly defer to any requests made by the GCHQ to shut down the paper’s reporting. That such repressive measures come from British political culture is to be expected. The political elite of that country cling desperately to 17th century feudal traditions. Grown adults who have been elected or appointed to nothing run around with a straight face insisting that they be called “Lord” and “Baroness” and other grandiose hereditary titles of the landed gentry. They bow and curtsey to a “Queen”, who lives in a “palace”, and they call her sons “Prince”. They embrace a wide range of conceits and rituals of a long-ago collapsed empire. 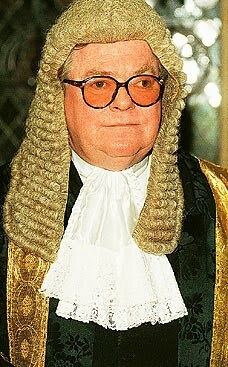 The wig-wearing presiding judge who issued this morning’s ruling equating journalism with terrorism is addressed as “Lord Justice Laws”, best known for previously approving the use of evidence to detain people that had been derived from torture at Guantanamo (he can be seen here). None of this behavior bears any relationship to actual reality: it’s as though the elite political class of an entire nation somehow got stuck in an adolescent medieval fantasy game. But the political principles of monarchy, hereditary privilege, rigid class stratification, and feudal entitlement embedded in all of this play-acting clearly shape the repressive mentality and reverence for state authority which Her Majesty’s Government produces. That journalism disliked by the state can be actually deemed not just a crime but “terrorism” seems a natural by-product of this type of warped elite mindset, as does the fact that much of the British press led the way in demanding that the Guardian’s journalism be criminalized (not unlike how many members of the American media have become the most devoted defenders of the NSA and have taken the lead in demonizing the journalistic transparency brought to that and other government agencies). As we made clear long ago, the obvious objective of these attacks – to intimidate the journalists working on this story and deter future disclosures – will remain completely unfulfilled. Since David’s detention and the compelled destruction of the Guardian’s computers, there have been a spate of top secret GCHQ documents reported on and published around the world: many of which, to its credit, have been published by the Guardian itself. They include detailed reports on GCHQ’s attempts to compromise basic encryption methods used to safeguard internet security, the GCHQ’s role in spying on the Brazilian oil company Petrobras, the GCHQ’s targeting of UN charities and officials, the GCHQ’s use of “dirty tricks” including “honey traps” and fake victim blog posts, the GCHQ’s attacks on “hactivists”, GCHQ’s surveillance of YouTube and Blogger activity and related activities to covertly influence internet discourse, GCHQ’s surveillance through phone apps such as “Angry Birds”, and – just yesterday – GCHQ’s covert monitoring of visitors to the WikiLeaks website. Needless to say, there is much more GCHQ reporting to do, and nothing about today’s ruling – or anything else the UK Government can do – will stop that. It is not difficult to apprehend the reason the UK government is so desperate to criminalize this reporting. The GCHQ itself made the reason clear in a once-secret memo previously reported by the Guardian. The British agency “has repeatedly warned it fears a ‘damaging public debate’ on the scale of its activities because it could lead to legal challenges against its mass-surveillance programmes.” Among other things, “GCHQ feared a legal challenge under the right to privacy in the Human Rights Act if evidence of its surveillance methods became admissible in court.” In particular, the spying agency feared that disclosures “could lead to damaging public debate which might lead to legal challenges against the current regime.” Privacy groups have now commenced such lawsuits against the GCHQ. While the US government claims to have killed Osama Bin Laden on May 1st 2011 in Pakistan, all of the evidence, ignored by the mainstream media, strongly suggests that the “terror mastermind” died many years ago. The US and world public are being deceived on an almost unimaginable scale. How many people will fall victim to this latest deception, and what are the consequences of believing such a monstrous lie? http://usawatchdog.com/united-states-… – Can we pull the world out of this economic calamity? Former World Bank Attorney Karen Hudes says, “It may be that we don’t, in which case, we end up in what happened just before we went into the dark ages, when gold went into hiding . . . . We can bring this gold that belongs to humanity out of its cloak of secrecy and out of hiding or we can go back into the dark ages. And we can have pestilence and starvation. . . . Civilization breaks down. We cannot pay for our international trade. Either we take back our gold, our legality, and we tell this group that thinks it’s above the law that it is not above the law, or we can kiss ourselves goodbye. Humanity will not continue, we will have World War III. Join Greg Hunter as he goes One-on-One with former World Bank Attorney Karen Hudes.